France has launched its first missions against Islamic State (IS) militants from its Charles de Gaulle aircraft carrier, military sources said. The newly-deployed carrier has 26 fighters, tripling French capacity. French President Francois Hollande has vowed to intensify strikes against IS in Syria and Iraq after the group said it was behind deadly attacks in Paris. Belgian police meanwhile said they had arrested five more people in anti-terrorism raids. France stepped up its bombings of IS following the attacks on Paris, in which 130 people were killed. 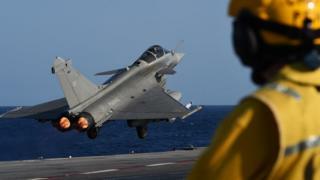 The latest series of strikes launched from the Charles de Gaulle targeted sites in Iraq, the French military said. On Monday, Mr Hollande met British Prime Minister David Cameron for talks as part of a fresh diplomatic push. He will also meet the leaders of the US, Germany and Russia this week. Mr Hollande said: "We will intensify our strikes, choosing targets that will do the most damage possible to this army of terrorists." Media captionDavid Cameron: "We will do all in our power to support France to defeat this evil death cult"
The two leaders agreed to step up co-operation on countering international terrorism, including increased data-sharing and sharing of airline records. Mr Cameron offered his support for Mr Hollande and said it was his "firm conviction" that Britain should also be striking IS in Syria. Earlier, Mr Hollande and Mr Cameron visited the Bataclan concert hall, where at least 89 people were killed. In Brussels, the federal prosecutor's spokesman said five people had been arrested following a police operation on Sunday night in the Brussels region and in the Liege region. These arrests bring to 21 the number of people arrested as part of Belgium's ongoing terror alert. But Salah Abdeslam - suspected of involvement in the Paris attacks - remains at large. This is just the start of Mr Hollande's week of diplomacy. The emphasis in each meeting will be slightly different. Aside from the need to assess the US-led military strategy in the Middle East, there are growing calls from European leaders to improve intelligence- and data-sharing. Security forces in both France and Belgium have been embarrassed by revelations that key suspects behind the Paris attacks moved around freely in the weeks leading up to the assaults, and in the days afterwards, even passing through checkpoints with apparent ease. And hanging over all the discussion of military and technical co-ordination is the elusive goal of a political solution in Syria that can help eradicate the militants' territory and source of revenue. That's likely to be central to Thursday's talks in Moscow, between Mr Hollande and Vladimir Putin, his fourth national leader in as many days. As experts point out, France - with its historically cordial ties to Russia, its membership of Nato, and its presence in the Middle East region - is in a unique position to help procure an agreement, and with it greater security at home. The Belgian capital, Brussels, meanwhile remains on the highest level of terror alert for a third day. Universities, schools, large stores, shopping centres and the metro system will stay closed on Monday, following renewed warnings of possible attacks. Soldiers are patrolling the streets of the capital. Belgian Prime Minister Charles Michel said that everything was being done to return the city to normal as quickly as possible - but the authorities feared a repeat of the events in Paris. Brussels has been on lockdown all weekend amid a manhunt for Salah Abdeslam. Mr Michel told reporters that authorities feared "an attack similar to the one in Paris, with several individuals who could also possibly launch several attacks at the same time in multiple locations". The Belgian authorities have so far charged three people with involvement in the Paris attacks. French media have reported that nine militants carried out the attacks on 13 November, and seven died.